The cuckoo clock is a time-honored timekeeping tradition, with the most famous choices coming from the Black Forest in Germany. We’ve researched and reviewed a variety of amazing clocks to help you find the best cuckoo clock, whether you’re a collector or looking to spice up your interior decorating! 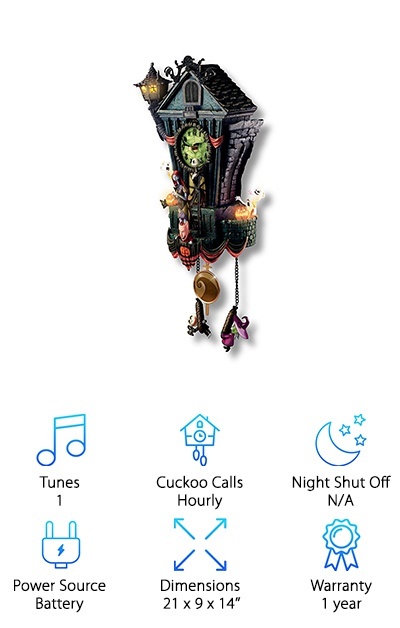 But first, take a look at the following features to consider when choosing a cuckoo clock for your home. Tunes - From simple chimes to full melodies, some clocks come with multiple tunes that play when the clock strikes. Cuckoo Calls - How often does the cuckoo call? Most clocks are set for half-hour or hourly cuckoo calls. 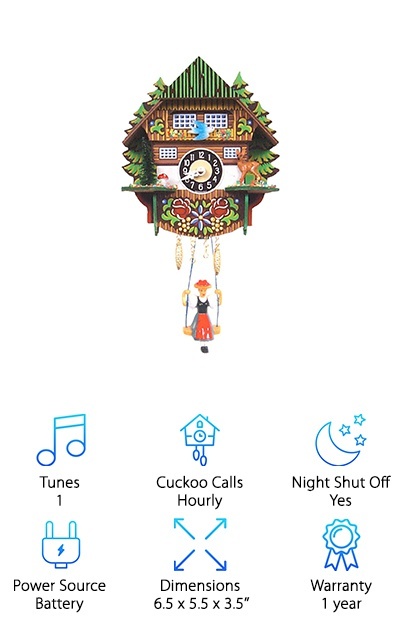 Night Shut Off - Some cuckoo clocks can be silenced for nighttime, while others actually shut off automatically on their own! Power Source - Some modern clocks use batteries, while others use the traditional mechanical winding system with weights and chains. Dimensions - Don’t be surprised by a mammoth clock or a miniature--the dimensions tell you a lot about the clock! Warranty - Some manufacturers provide warranties as a way to display the quality of their product. Longer is better! Our Black Forest clocks review starts off with a top pick and budget pick for our overall favorites, but that’s not all! There’s a world of clocks to choose from, and we’ve tried to review a wide variety of options. Time is ticking away--let’s dig in! At the top of our list for the best Black Forest clocks is this gorgeously detailed Hones cuckoo clock in the chalet style. This clock features a mechanical Regula movement and a music box from the Swiss company Reuge. At the top of the hour, Happy Wanderer or Edelweiss will play and the figures at the sawmill and the attic window will move. You can silence the clock with a built-in lever for a quiet night’s sleep. Lifelike hand painted details and wood carvings make this a lovely rustic clock for your home. It needs to be wound every day using the chains and traditional pine cone weights. You can adjust the clock hands left and right without harming the mechanical movement, allowing for small changes should the clock fall behind or skip ahead. This gorgeous clock from Hones would make a great addition to any collection or add nostalgic joy to your kitchen or living room! 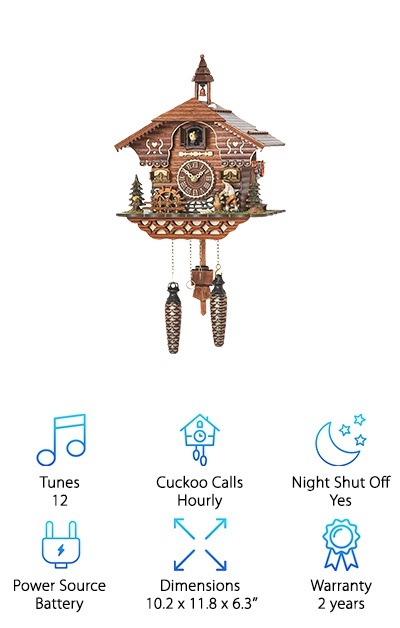 Looking for a miniature chalet cuckoo clock that’s easy on your budget? 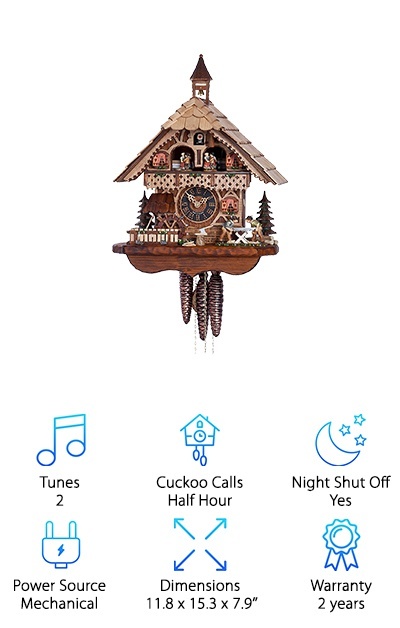 This authentic cuckoo clock is made in Germany and works well in small homes or as a gift for children and adults alike. 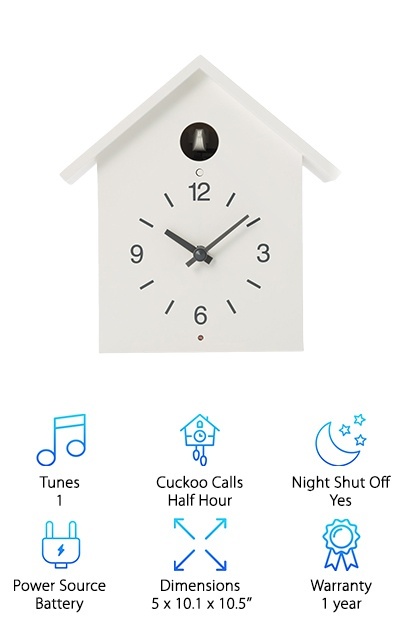 This battery-powered clock features a cuckoo sound but no moving cuckoo bird. Instead, it has a pendulum styled as a girl in traditional Bavarian clothing on a swing that moves back and forth. Bright painted details and floral designs make this an adorable addition to your home. A control switch lets you change the sound mode to cuckoo, Westminster chimes, or silent. You can shut it off at night for a peaceful night’s sleep! Try out this Engstler mini size model cuckoo clock and enjoy its modern features combined with a rustic retro design. If this clock doesn’t suit your tastes, keep reading! We’ve got more options on the way! Made in Germany in the chalet style, this quartz cuckoo clock uses an accurate quartz movement that runs on three baby C batteries. The rustic design of this wooden clock features hand-painted details and traditional pine cone weights. At the top of each hour, one of twelve familiar tunes will play, including nostalgic favorites like Clementine and Home Sweet Home. The chiming stops automatically at night when you turn down the lights. A two-year warranty ensures you’re getting a quality product along with those neat details that make it easier to use and maintain than traditional mechanical clocks. It has a relatively small, unintrusive size at just 12’’ high, not including the weights and pendulum. The automatic night shut off feature means you can even mount this clock in your bedroom! 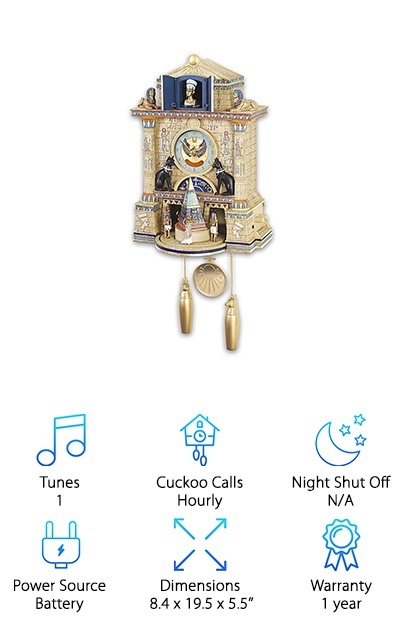 It makes a great gift for clock lovers and fans of cuckoo clocks. This handcrafted wood cuckoo clock from Kendal offers traditional style with modern interior workings. It’s battery-powered with an automatic night shut-off sensor for silent operation during resting hours. At the top of each hour, the cuckoo pops out and a proscenium with four painted figures rotates to the tune of different nursery rhymes and songs. You can adjust the volume of the chimes and tunes throughout the day depending on your needs. Hand-carved wooden deer and forest details surround the clock face. You can use a button on the side to set the correct hour--the pendulum and weights are decorative. The large size of the clock makes it a great statement piece to impress your guests, measuring 26’’ tall, not including the tails. 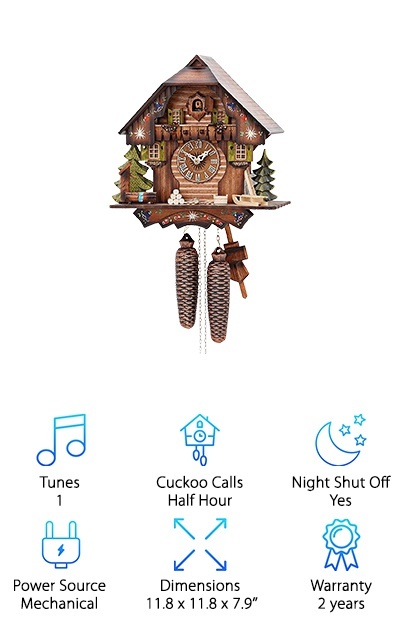 Overall, this is a great little basic cuckoo clock, perfect for imitating the Black Forest style without the Black Forest price! The ISDD Black Forest Chalet-Style Cuckoo Clock combines painted details in a rustic style with traditional mechanical Regula cuckoo clock movement. A lever allows you to silence the cuckoo for a peaceful night’s rest. This German cuckoo clock features a cabin framed by evergreen trees with eye-catching painted details that offer a brighter alternative to the darker traditional cuckoo clock. Walnut wood is used for the dial, hands, bird, and frame, with painted shutters and floral details. It comes with a two-year warranty and a certificate of authenticity from the Black Forest Clock Association. It has an eight-day running time and requires mechanical winding once a week with the traditional pine cone weights.You can turn the wooden hands left and right without hurting the Regula movement, which is helpful for making small adjustments. This is a cheerful little clock that can add a rustic country vibrance to any home! 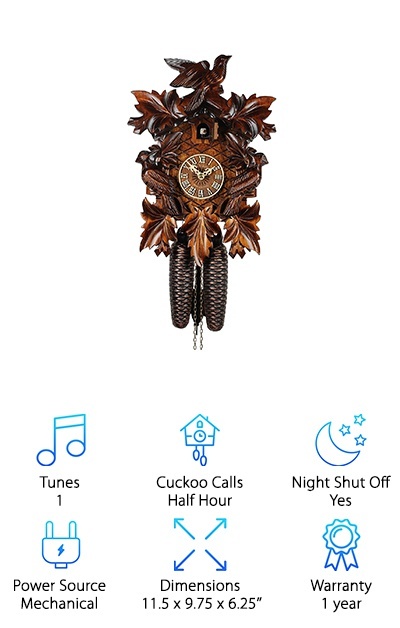 This traditional-style owl cuckoo clock offers fantastic walnut carvings and a mechanical Regular movement. A lever allows you to silence the clock for a restful night or quiet day, and the clock hands can be turned left and right without hurting the mechanical rack strike movement. This eight-day clock needs to be wound once a week using the chains and traditional pine cone weights. It comes with a five-year warranty--that’s some serious quality! The cuckoo calls on the half hour and gives the number of hours at the top of the hour. Carved wooden owls and leaves frame the wooden clock face with a wooden dial and hands. The owls have great little details, including shiny amber-colored eyes. It’s a well-made heirloom from top to bottom. You’ll also get a certificate of authenticity from the Black Forest Clock Association, so you have proof of your cuckoo clock’s craftsmanship! If you love the nostalgia of traditional cuckoo clocks but want a simple, modern take on the design, the MUJI cuckoo clock might be perfect for you! This smooth white clock in the shape of a bird house has a few nice modern features that will fit in perfectly with your modern home. The cuckoo pops out and chimes every half hour, and a light sensor shuts off the cuckoo when it senses a dim or dark environment. You can also turn off the chime for a quiet day with your clock. This clock can be wall-mounted or set on a mantle or tabletop, and runs on one AA battery. Muji offers a variety of cute cuckoo clocks in different sizes and colors. 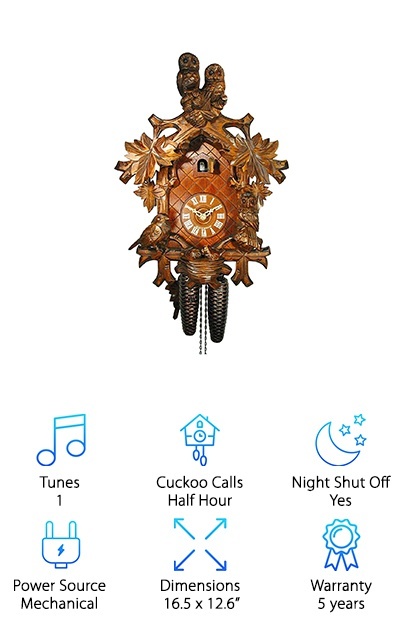 Combine a little bit of technology with an adorable cuckoo clock that can match with just about any decor. 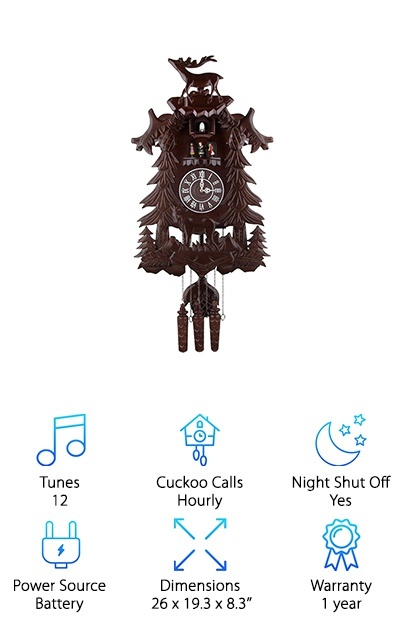 If you’re a fan of Tim Burton’s “The Nightmare Before Christmas” or want a seasonal cuckoo clock that can transition from Halloween to Christmas, Bradford Exchange has a funky sculptural cuckoo clock just for you! Optional LEDs light up the ghosts, pumpkins, and Jack’s Tower for a spooky nighttime display. The clock face mimics the Town Hall clock shown in the film combined with an accurate quartz movement. At the top of the hour, “This is Halloween” plays while Zero pops out of the doors above the Town Hall. A brass-toned pendulum swings underneath for an authentic cuckoo-clock touch. Hand-painted details show off some of your favorite characters from the movie, including Jack Skellingotn and Sally, and the trio Lock, Shock, and Barrel. With the pinecone weights, it measures a stunning 21’’ tall. It’s all battery-powered for total convenience that will make a great conversation piece in October! Modern cuckoo clock collectors won’t be able to resist this Treasures of Ancient Egypt clock! Pay your respects to Egyptology with this Egypt-inspired clock featuring Queen Nefertiti’s bust in place of the traditional cuckoo. This limited edition clock plays an exotic melody as Queen Nefertiti emerges and her royal procession rotates each hour. Hand-crafted with a precision quartz movement, this battery-powered cuckoo clock features decorative weights and hand-painted details. The bottom is lined with felt, so you can remove the decorative weights and display the Treasures of Ancient Egypt as a mantle clock. Other details include golden sphinxes, Bastet cats, and turquoise lotus flowers. The clock comes hand-numbered with a matching Certificate of Authenticity, perfect for history buffs and collectors alike! It combines handcrafted detail and style with the modern convenience of batteries and accurate quartz movement, all displayed in a striking golden finish. Adolf Herr offers a variety of gorgeous options for traditional Black Forest clocks. This particular clock is hand-carved from dark walnut, featuring cuckoo-birds and leaves framing a clock face with a wooden dial and wooden hands. Pinecones form the weights at the ends of the chains. If you’re looking for an eight-day clock with a weekly wind-up for a traditional antique-style clock with all of the traditional cuckoo clock parts, you’re in luck! Your clock will arrive signed by Adolf Herr and with a certificate of authenticity. The Regula rack strike movement won’t disturb you at night, when you’re more interested in sleeping than enjoying your cuckoo clock! This Adolf Herr cuckoo clock offers all of the craftsmanship of the original Black Forest designs made in Germany and a pretty chime, too. Not include the weights and pendulum, the clock body measures 11.5’’ high, 8.75’’ wide, and 6.25’’ deep.